Fishing jigs in a time when bass lures are getting more and more exact in their replication of bass prey, some even approaching works of art, seems to many to be "old school", even boring some might say. However, the venerable jig remains one supreme bass catcher. Why? It's a chameleon, capable of looking like so things bass eat. It's more versatile in presentation and appearance than just about any other lure. Another thing, bass jigs have a well deserved reputation for catching BIG BASS! Every time you're fishing with jigs you stand a chance of catching a "hawg". That possibility and the anxious anticipation that goes along with fishing jigs make them well worth fishing to me. Now it must be pointed out that fishing jigs is not for those who shy away from a challenge because success with bass fishing jigs is not always easy. It's a challenge requiring skill, vigilant attention to detail and a keen sense of what is happening to your jig at all times. It requires patience and persistence. Being a good jig fisherman sets you apart from the others and is something to be proud of. What Makes A Jig A Bass Jig? 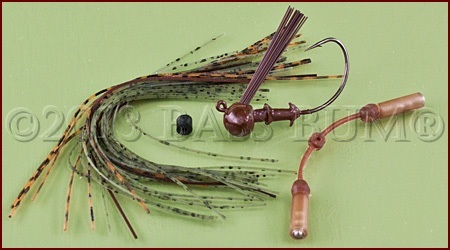 Jigs are an assemblage of a lead head jig, hook, rubber, silicone or hair skirt sometimes a weed guard, sometimes a trailer and sometimes rattles. The heads are sometimes painted, sometimes not. They are made in many shapes, round, football, cone and pointed and one swim jig design even resembles a Stealth fighter bomber. Sometimes they are even reminiscent of something that chased you in a bad dream with large bulging eyes and a fierce face. In the past natural hair (bear, dear, rabbit) jigs were the rage. Though hair fell from grace with the advent of synthetics, silicone and living rubber replacing "naturals" as the material for jigs, it has made a comeback in recent years. The hook is all important when fishing jigs. Depending on when and where you're fishing them you might do best with a thin 2/0 wire hook while in a different situation of thicker cover you'll need a heavy, thick shaft 3/0 or 4/0 hook. The range of jig sizes runs from tiny to humongous, relatively speaking. There are finesse jigs (for clear, shallow water) and then there are football jigs (for deep, darker water, in heavy cover) seemingly big enough to knock a guy out in a fight. The most popular sizes are 1/8, 1/4 and 3/8 ounce though many other sizes, bigger and smaller, are used in specific situations. When fishing jigs water depth and clarity are significant considerations when making a decision on jig size. Rule of thumb is to use the lightest jig on the lightest line you can in clear water. If you're flipping to thick cover then a heavier jig and line are called for. 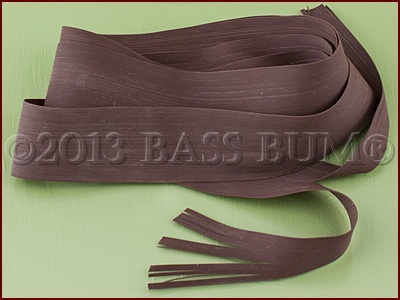 There are many bass jigs available in tackle shops that are alleged ready to fish out of the package. 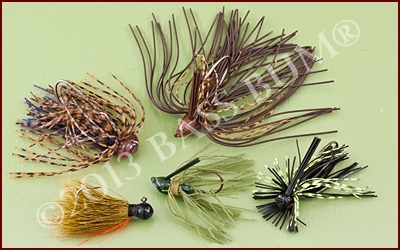 Bass jigs come in every size and color lead head and every length and thickness of skirt you can imagine. 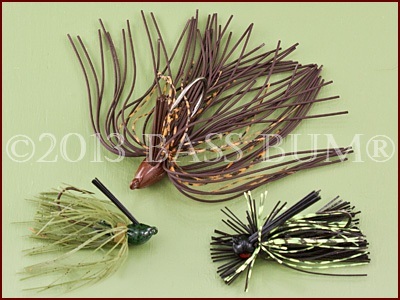 A jig can be made to appear as a crawfish, bluegill, shad, whatever, just by the color combination and arrangement of skirt strands and type trailer added. There are skirts made from silicone and rubber. Each material has its own unique handling features and movement under water. With commercial rubber and silicone skirt material available from tackle shops and mail order houses you can "trick out" your jigs to look like most anything bass eat. That's one aspect of bass jigs that adds great fun to their use. They are easy to make yourself, a subject we'll cover in later pages. It can be said without hesitation that you will catch far fewer bass with a jig that has no trailer than you will with one sporting a correct size and color appropriate trailer. Trailers complete the package so to speak. Trailer size is important. They contribute to the overall size of the jig when combined with the jig's head and skirt. Jigs with smaller trailers tend to draw more strikes than those with large trailers but big profile jigs attract the attention of "big bass'. Additionally, besides contributing to the overall size, they also alter jig profile and affect drop speed. Of course they also bring complimentary or conflicting color to the final jig lure. Weed Guards Can Prevent Hang-ups And Hook-ups! These are intended to minimize "hang ups' be it grass (weeds), brush or upright or laydown timber. Whether wire or fiber, weedguards can inhibit your hook set. But that's a trade off you make so you can fish weeds and cover that are hang outs for bass but which also present an environment for hang-ups. Generally speaking, wire guards are effective in grass and thin brush like willow trees. If you're working any serious type heavy cover a fiberguard will perform better. Fiber weedguards are more often than not too stiff and too thick when they come out of the package. A trim and thinning, appropriate to the cover you're fishing, is usually beneficial. This will also reduce the incident of rejection by bass after they feel a too stiff weedguard as well as reducing effective hook setting as thick weedguards can do. Most common jig hook is either a heavy wire O'Shaughnessy or light wire Aberdeen with eyes angled in-line or flat at 60° or 90°. 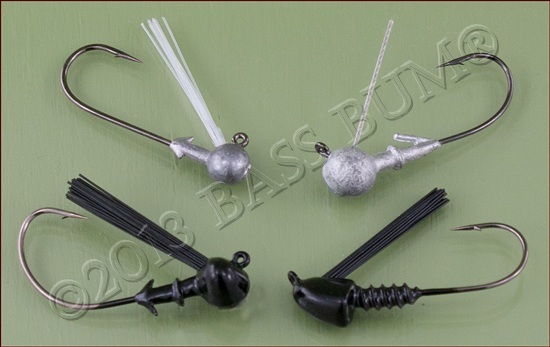 For bass, long shank hooks are used most as these accommodate soft plastic lures like lizards, worms, tubes etc. 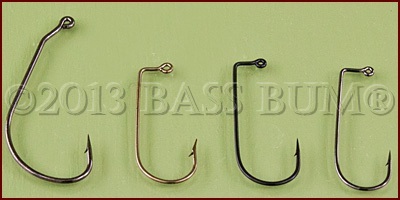 Those shown in the photo above right are some I use in making my own jigs. There are many others available in different shapes, curves, eye angles, lengths and wire thickness. Got Your Jig? Now Get Your Gear. Start To Fish! Fishing with jigs requires powerful rods, heavy horsepower reels and the right line. If you're fishing jigs in grass or other heavy cover you would do well to use a "flippin stick" rod or at least a "heavy" rated rod. If finesse fishing a quality 7' medium or medium heavy rod is the tool you need. 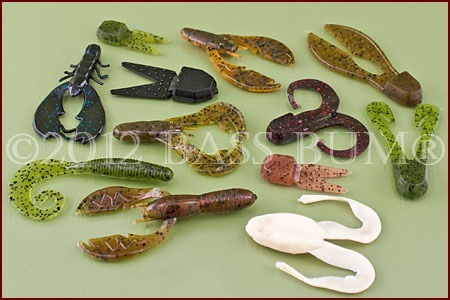 Fishing jigs includes crawling, hopping, jumping, flipping, pitching and casting. You can swim jigs too. Though they can be productively fished across gravel bottoms they excel around "objects and cover". Like weed lines, weedless structure and docks. When fishing jigs the best way to detect a strike that occurs as your jig drops is to watch your line as the jig sinks. Since jigs are often taken on the fall don't get caught being inattentive after you've made your cast. Remember, I've said it several times throughout this site, a bass can take in and spit out a jig faster than you can blink. Additionally, the upper jaw and roof of a bass' mouth is "tough", especially smallmouth making it even more difficult to set a hook. If you're asleep at the switch you're going to miss them! Keep a slight amount of slack in your line as it falls. If you have your line too tight the bass will feel you immediately, know something isn't right when it takes it and "out goes your jig". The sense something isn't right is compounded by the presence of a stiff bristle weedguard, not to mention the hard hook pressing against the roof of the bass' mouth.